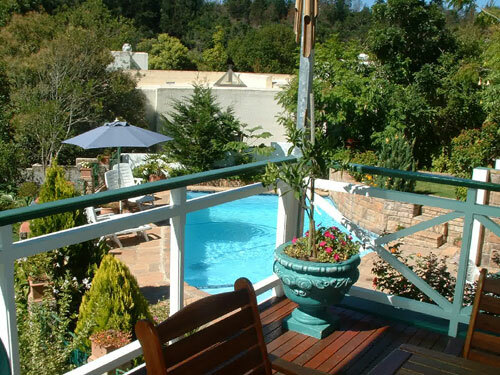 Edenwood Guest House, has been described as one of those “special places”, that one seeks when planning a holiday or business trip to the Garden Route, as 16 years of guest comments give testimony. We pride ourselves on welcoming guests with true South African hospitality and personal attention, so that they return as “friends” and by doing so, they also fix their rate for future visits, for three years thereafter. The houses, with their own unmistakable character, are set in the beautiful, safe and tranquil up market suburb of George, called Eden, adjacent to the Katberg Nature Reserve, which circles the George mountain dam. The position against the forest provides for a silent nights rest, away from traffic, yet quick and easy access to the town center, and is mere minutes drive from the exquisite golf courses, driving range, beaches, restaurants, shops, museums and other George/Outeniqua attractions. Our upmarket stylish rooms are all en suite and decorated in a tasteful and individual style, with all the modern comforts, such as top class beds with superior bedding and satellite TV. Delicious breakfasts are served in the elegant dining room or on warm sunny days, in the summer room, with its sweeping views of the garden and forest, which are of course included in the B&B rate. At the same venue, we are also proud to now be able to offer a lovely three bed roomed garden cottage, which has three bathrooms and a divine granite kitchen, lounge, dining room and barbeque, affording guests, groups and families, an oasis of peace and tranquility. Other services are free WiFi, and use of the computer to keep in touch with the outside world if you do not have your own. Secure off-street parking, travel, and tourist information, as well as business services, such as copies and fax, and a laundry service on week days. Relax and unwind around the salt water pool, set in the lush garden with mature shady trees, where prolific and unique bird life truly abounds. Many pleasant hours can be spent watching the birds from the summer room, the upper veranda area and even the main guest lounge, all of which face the indigenous forest at the foot of the garden. The elusive Knysna Loerie is frequently seen, as well as monkeys and other large and small species of birds. George as the hub of The Garden Route, with its temperate climate, is thus an idyllic setting, from which to make a base, and explore the many attractions the Garden Route has to offer. 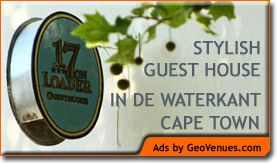 It is an easy drive to the adjacent towns Knysna, Oudtshoorn and Mossel Bay. So you do not need to relocate daily, just unpack, relax explore at your leisure and make Edenwood your home base. Bookings of more than three days qualify for an instant discount on the daily rate.